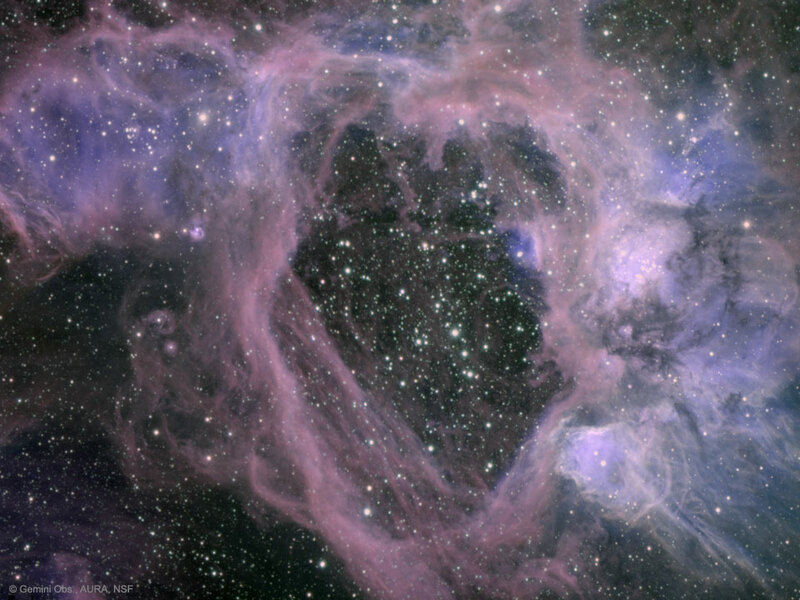 In the southern hemisphere you can see the Large Magellanic Cloud (LMC), used by this (Magellan) in navigation in this hemisphere, we can find the N44 that is nothing more than a gas bubble of 300 light years. This bubble, the strange thing is that it is not known because of its creation since it has been thought that it is an old explosion of a supernova or a series of them, that has conferred to the gas this form. It has also been thought to be mere chance. That is to say, gases and clouds have been placed in this form thanks to the cosmic winds (remember, cosmic radiation pushes the existing matter) and by mere chance, now, it has left a series of winds in that curious bubble form. Lately we think of a mixture of both supernova explosions that have generated clouds of gas and these have been modified and moved thanks to the cosmic winds. But the beauty of science (against religion) is that we do not have the answers for everything and the way we find them (and increase our knowledge) is by researching and learning, not always being the answer that we may like, not Is always the answer the simplest or even the best, but it is a reasoned answer.